The Misadventure of the Fabric Beads didn't teach me to stop looking for the most difficult way to solve a problem. After all, fabric and wire aren't the only things I have in the monster stash. I also have 2-part resin(of which more later), stuff to make the resin different colors, and an ice cube tray for making itty bitty hexagons. So I mixed a lot of resin,colored some of it green and some blue, and randomly poured resin and mixed colors. 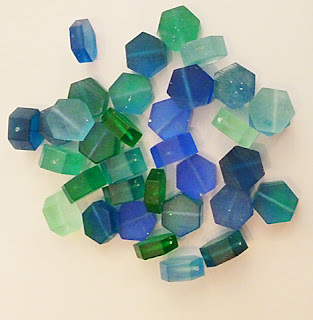 After giving it time to set, sanding the sharp edges, and drilling holes, I had...well, a little more than a handful of resin beads. I like these a lot better than the fabric beads, and they're definitely going on the wire across the top of the window, but, you know... I've also got these fantastic chandelier crystals that I want to have dangling down from the wire, and they are...not lightweight. And some of my old lampwork beads that I'm not doing anything else with; also not lightweight. So I stirred the bead box and stared at the two cup hooks on either side of the window and thought about the weight I was asking them to carry, and finally came to the obvious solution. 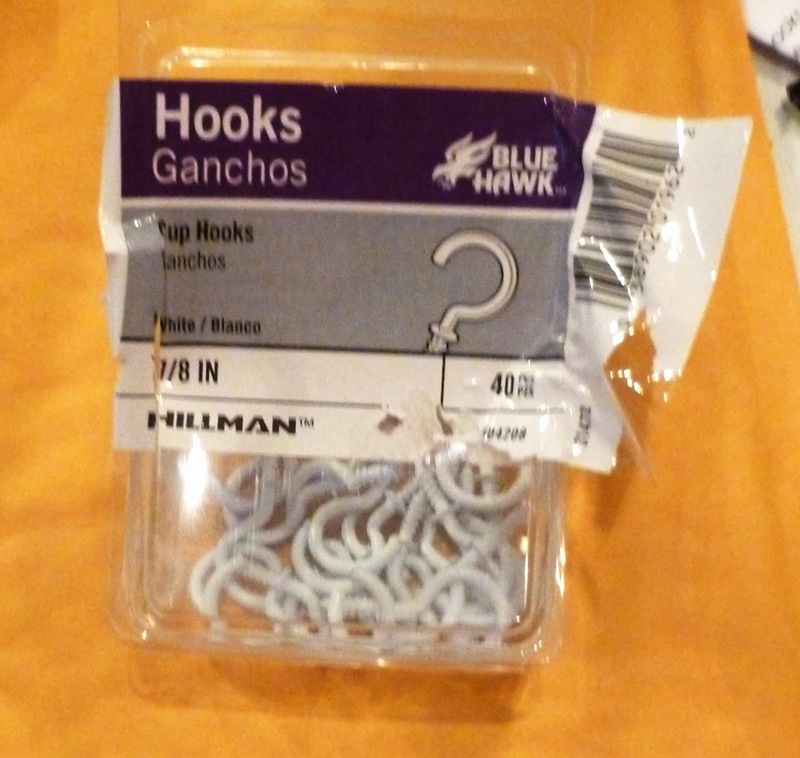 It's surprising how many places do not sell little white cup hooks. But I finally located these, and Steve put them up for me last night,and wasn't it clever of me to marry a tall man? I'm still fiddling with making the workshop beautiful without sacrificing either storage space or light, which is a tall order and also not something I work on full time, because I'd rather be making than decorating. In particular I want the corner where I do beadwork and resin work (no, not simultaneously; I'm not that crazy) to feel like a cool green underwater retreat. Which, if your starting point is Central Texas, is not really possible unless I spend way more money than I want to and block some light. Replacing the (large) window with a stained glass undersea scene would probably do it but I expect that would be prohibitively expensive, so I'm going for half measures. The windowsill is now loaded with things like jars of sea glass and iridescent desert glass, an acrylic carved castle I bought back in the Dark Ages, and my entire, way-too-large collection of freshwater pearls spilling out of a shell-shaped dish. I'll post a snapshot of that when the light permits; right now the afternoon sun is streaming through the window and sneering at my attempts to make anything look cool and green and watery. So, on to another bright idea: during the reorganization I found some boxes of beads that I hardly ever use, because they're too round and fat and heavy for bead embroidery and I'm really not that interested in stringing necklaces. What we will laughingly refer to as my thought process ran something like this: I could pull out all the transparent green and blue beads, which is more than half the collection, and hang them up in the window somehow... I'll put a cup hook at the top of the window on each side, string the beads randomly, and that way I can also use these chandelier crystals... That's going to be way too heavy, and I've got more than enough beads; better just use the lightweight acrylic beads on this wire... I do not have more than enough plastic beads... At this point your person of normal intelligence would either strengthen the supports or go to Hobby Lobby and buy them out of transparent plastic beads in ocean colors. Me, I decided to make my own. 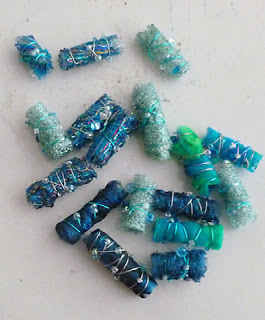 Fabric beads are nice and lightweight, and I've always wanted to make some with wire and tiny beads wrapped around them. 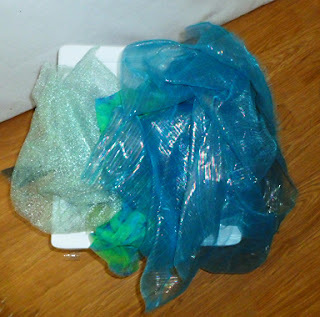 You will probably not be astonished to learn that I have an extensive collection of blue and green sheer fabrics. Even restricted to the synthetics (because I want to melt the beads into shape with a heat gun) I found quite enough variety. 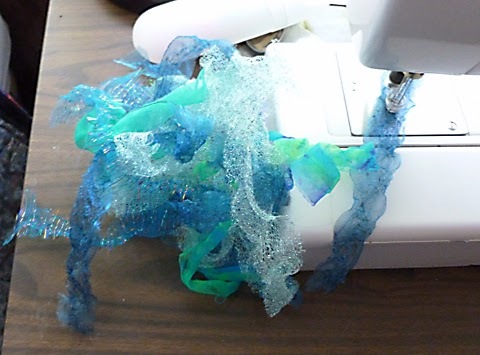 So here I am in the sewing room, cutting strips of sheer fabric. Next bright idea: let's run shese strips through the needle felter to make them nice and puffy. Finally, back to the new heatproof surface in the workroom(3 big ceramic tiles set very close to each other) with my ruffly strips, some 28 gauge silver-colored wire, and a mix of tiny clear/blue/green beads for embellishment. I use a fat aluminum knitting needle for a mandrel. Wrap a fabric strip around the knitting needle, remember that you should have threaded beads onto the wire first. 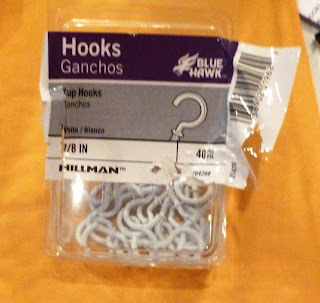 Ok, drop fabric and knitting needle and string a dozen little beads onto the wire. As you were, only this time I have the wire ready to wrap and hold the fabric around the mandrel until I heat-gun it into shape. Anchor the wire with a twist, shove a bead up next to the fabric strip, pull the wire a quarter-turn around to hold the bead snugly, repeat until out of beads. Then attack the whole thing with a heat gun, watching closely to hit that sweet spot between Not Melted Enough To Keep Shape and its reverse, So Melted The Fabric Is All Gone. I did get some pretty fabric beads. But after making this handful of beads I discovered that I do not actually find wrapping wire and seed beads around a strip of fabric all that fulfilling. It might be fun if I were trying to make huge, over-the-top,multiply embellished beads. But making beads whose only purpose is to be lightweight filler? Boring. And they don't even work for that;when I hold them up to the light, I don't see the colors of the fabric, I only see the tangled twists of wire. 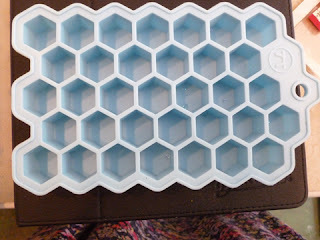 But it's not time to go to Hobby Lobby yet; I've got another idea to try out. And if anybody would like a handful of fabric beads wrapped with wire and little beads,send me your address and I'll be happy to stick them into a padded envelope. Use the gmail address: margaretballseven at gmail.com, substituting an Arabic numeral for the seven and that symbol for the at.